My colleague, Chinese teacher Wendy Liao, has kindly agreed to co-author the following post, detailing her experiences using the iPod Touch for the teaching of Chinese language. I think she has fantastic ideas for the use of technology in Language teaching which need to be shared! 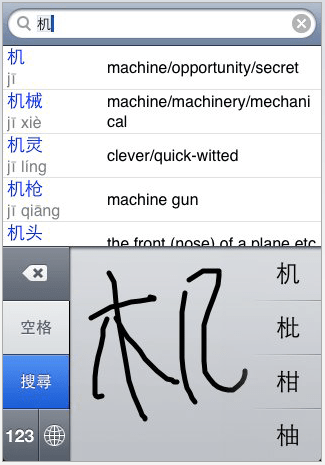 In the same way that we have bi = 2 and tri= 3 in English, Chinese has root words (or radicals) as well, e.g. 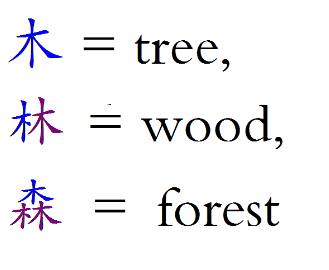 木 = tree,　林 = wood, and　森 = forest. They all have the root word of ‘tree‘. 妈　姐　奶　姨 = Mum, Sister, Grandma, and Aunt, all have the same radical of female 女. One way Wendy might have previously taught this sort of lesson is to give each child the Chinese characters together with their meanings. She would then show them how to write the character, and try to emphasize the importance of writing each character in a particular order. The trouble was, she tells me, the kids would never remember about writing the character in the right order, meaning they were missing the opportunity to understand more complex characters as the radicals weren’t clear to them. This is where the iPod Touches came in. She used this free Chinese/English Dictionary app: It is a basic dictionary app which allows you to write the characters, and then provides the pinyin, together with the definition in English. Wendy gave the list of characters, this time without the definitions. She gave a check sheet showing the stroke order for half of the words, but the rest, students would have to figure out themselves. Using the iPod Touches was particularly motivating for the students – they were absolutely determined to find out the meanings, they were eager to write the characters correctly so the dictionary would be able to find the definitions, and they were great at helping each other and making suggestions for ways of writing the characters. Every child had hands on experience of drawing the root of the characters. Not just once, but repeatedly. This was because if the characters weren’t written fairly well the dictionary couldn’t read it. Therefore the children had plenty of practice in trying to form the characters correctly. What empowered children more was that they could keep trying and different characters kept coming up in the dictionary and even at the lower level they look for patterns and shapes to try and match the correct character with their own attempt. The language between the children was constantly reinforcing the correct way of writing. For instance they would say, ‘no not like that, top to bottom’, or ‘that’s not straight’. This application was also very good for hand eye co-ordination and this skill can be transferred to other areas of learning. In addition, the problem solving skills developed were very clear. Use of trial and error, looking for patterns to make links with, using prior knowledge were all important strategies. Collaborating with a partner to assess where each child might be going wrong was very beneficial to improving their attempts and then sharing their findings. Persisting even when the tool they were using didn’t seem to be able to understand their writing was also a good development. Knowing how a dictionary works, whether for Chinese or any language was key in the activity and children progressed in their understanding of using it. Finally the most important aspect was that the children were engaged and motivated. What might have been a tedious dictionary lesson, turned into a very powerful learning situation which would aid children’s memory of characters and vocabulary suitable for various levels of ability. 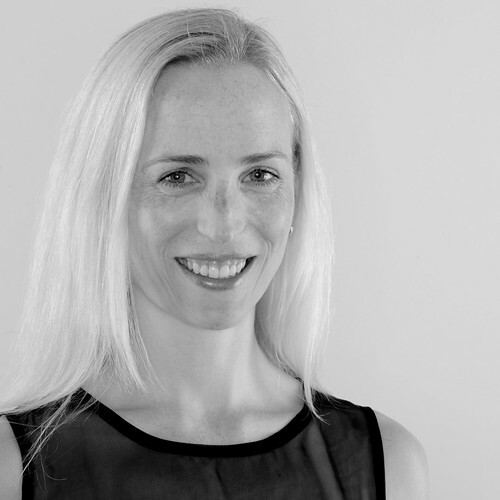 I hope this approach proves useful to people, and that it sparks some other great ideas. We would be very interested in hearing other ways iPod Touches are being used in Language lessons, so please let us know what is going on in your classroom/school. 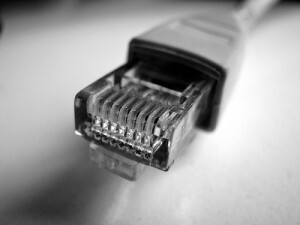 After the success of Fruity Fridays last year, we decided to introduce our staff to two new initiatives this year: Tech Tip Tuesdays and Wired Wednesdays. I have graciously been given 5 mins at the beginning of every staff meeting to talk through a tech tip for teachers. I will be sharing a range of things, from IWB ideas, to simple things such as tabbed browsing. It’s nice to have a regular slot to push some technology info that will hopefully be useful and relevant for all teachers. On Wednesday mornings from 7:15am, Katie (our Teacher Librarian), Haidee (Grade 3 teacher and in-campus Studywiz expert) and I have made ourselves available to all staff requiring tech help, support and/or ideas. So far it’s been running for two weeks, and I am thrilled at the turnout we’ve had. Week one we had some looking at IWB techniques (like these ones from @pennyryder), some looking at the new library catalogue and ways of navigating it, another group was getting support with StudyWiz, one teacher wanted advice on how to set up a Google site and another was about to launch her first blog. 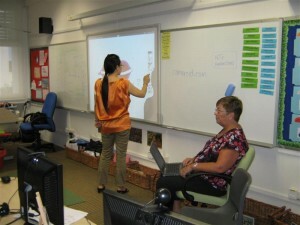 Week two saw more diversity: our Chinese Language team were all here for tips on using the IWBs, another teacher was learning how to merge cells in a table and add colours, the wireless keyboard/mouse was being demonstrated, and our Principal came in wanting to know more about Twitter. We have had positive feedback from many people about the Wired Wednesday format. They like the flexibility of being able to pop in with problems related to them, they appreciate not having to be locked in to attending every week, and they feel they have someone to go to get help. I know how they feel. Recently, when I was learning how to use Prezi, I thought a lot about how much easier it would be if I was sitting next to someone who knew how to use it already. Thankfully, @RobinThailand was only a tweet away, but even so, having someone physically there would have made all the difference. I believe having access to someone to work alongside is so important in learning, particularly with technology. It ties in nicely with Vygotsky’s Zone of Proximal Development. Anyway, our admin team have since been leading the way, ensuring their presentations to students, staff and parents use fabulous visuals, limited text and are delivered with confidence. I can’t tell you what a difference it makes! Staff meetings become more interesting and engaging. Imagine that?! It feels like we’re at the start of something big.